» Yeah, but what is life really about? 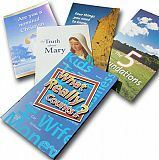 These free bible tracts were designed and printed by Tracts4u.org. We are based in New Zealand, and are a small non-profit christian organisation wanting to aid fellow believers to witness and share the gospel of Jesus Christ through tract distribution. PDF artwork is available for printing presses should you wish to print the tracts yourself. We are a faith-based ministry, so we publish and ship tracts as the Lord enables. Consequently we may not always be able to ship tracts immediately and fully meet requests for larger quantities (e.g. requests for >100 tracts per total order) and we pray that you will understand this. As we are shipping from New Zealand, overseas orders may take at least 6 weeks to arrive. If you would like to support us financially, please go to our Donations page, where we have a link via PayPal. The donation you give is greatly appreciated and will allow us to print and send more tracts. If you are interested in receiving some free printed christian bible tracts or the PDF artwork; please contact us by using our shopping cart system below. Are you a nominal christian? Yeah but what is life really about?